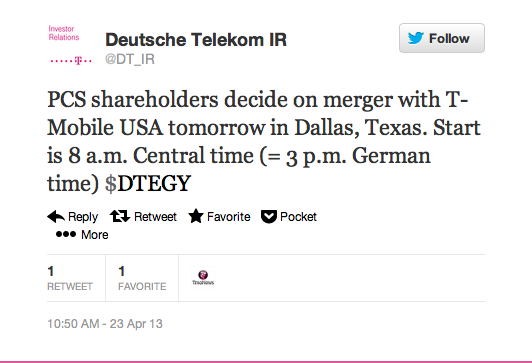 Just a quick reminder for everyone out there that tomorrow marks D-Day for the T-Mobile USA/MetroPCS merger. Widely expected to go through after Deutsche Telekom upped the offer, MetroPCS shareholders will begin voting at 8am Central Time tomorrow. Results are expected later in the day and I expect we’ll hear from both companies sometime tomorrow evening. Stay tuned for the final vote tomorrow! ← Will T-Mobile Be The First Carrier To Offer An LTE-Advanced Network? GS4, and a proposed merger that could possibly strengthen the overall footprint of the tmobile LTE network!?!? I hope the servers are up to par this go around or it might be days of store outages! Hope so too cause I am ready to place my order as early as they put it online.. Locked and loaded check! Tablet, phone, and laptop are locked and loaded as well! Only way to make tomorrow more perfect would be to activate LTE in more cities tomorrow (and make one of them New York). I can understand your impatience but good things come to those who wait. I say that because here in Kansas City the LTE network is just okay. When I can get on it the speeds are ace, but the phrase to pay attention to is “when I can get on it”. Once the network gets fully deployed I’ll stick with hspa+42. I haven’t seen full bars of lte yet on my note 2. Maybe the gs4 will be better with different chip tech. Soo about what time should I expect to see the Galaxy S4 go up for sale online? I still haven’t gotten my jelly besns update on my lg l9. Wish I could be picking up a black HTC One tomorrow…hopefully t-mobile will pick it up. Sprint and T-mobile need to hurry up and merge like yesterday. Let’s face it, neither carrier will ever individually surpass the top 2. Yes, because Sprint did so well last time that they merged 2 companies with incompatible technologies. The biggest problem with that merger is that Sprint chose to keep both technologies around versus migrating everyone to one tech. If T-Mobile does a good job migrating Metro’s customer base to gsm that would look good if T-Mobile ever controlled a combined T-Mobile/Sprint. All phones Metro PCS stores will sell after T-Mobile is in control will be ones that work on both the Metro CDMA and T-Mobile GSM networks. Their customers will be buying into the new network without even knowing it. The CEO in charge of the Nextel merger resigned years ago. Hesse is actually a very good CEO. He has tripled their stock price in a year. I would hate a Tmobile/Sprint merger, because we would lose a valuable choice. The best we have is 4 major players. if this deal goes through will we see better signal and an increase in 4g speeds and all other speeds all-round improvement? how come no apple quarterly earnings? but we get samsungs quarterly earnings. Hmmm, wonder where the hell Yarrell is…lmfao. If approved, will there be more coverage ?? Please say yes ..